Darts is the ideal game if you've got a competitive drive and a high degree of aiming accuracy. This game is played in probably every country in the world and is cherished by an untold number of people. There tends to be three main types of dart games, using a dartboard. They are known as 901, 301, or 501 darts. These are simply starting scores; the higher the number, the longer the game, for the same principle applies to each of the three types - the first player to run out of points, wins. This particular game of darts I play is quintessentially basic and doesn't involve the fancy particulars of traditional dart games. It leaves out having to score a certain way to end the game and focuses on reducing your starting score to zero. Obviously, the bullseye of any given dartboard is the target of choice. Those contain the highest points. 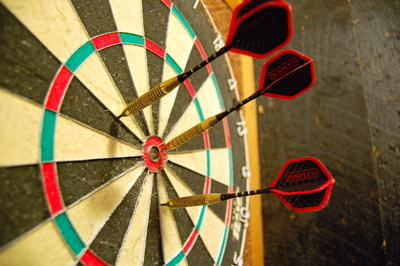 The further away from the bullseye your darts hit, the less points that will be deducted. Simply put, if you happen to be the best dart player in the world and can hit the bullseye every time, your game will be a lot shorter in duration. I suggest setting a handicap if you're superior to your mates in dart games. That is, you play 501 darts while your companion sets his starting score to 301.